social contact was my masters thesis at nyu tisch school of the arts. 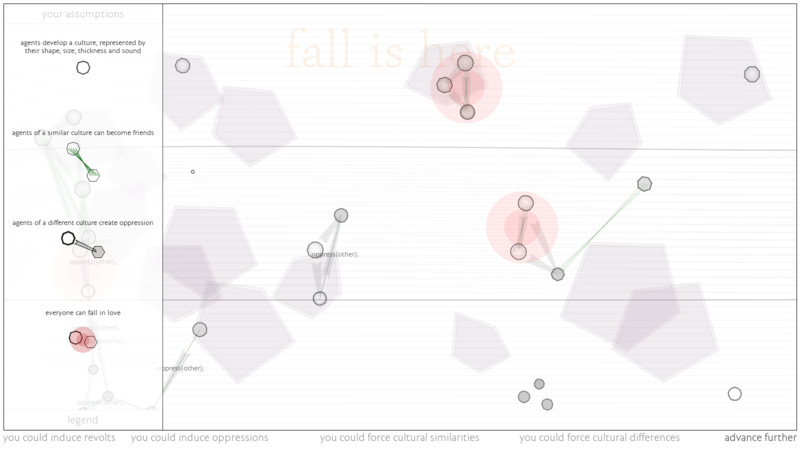 it tries to simulate political thought by implementing it in code and letting people play around with it. social contact is an experiment in systems design. it is an enquiry in both how software systems work, and how political systems work. both of those are, essentially, a set of rules governing our behaviours, based on what we should and should not do, on who we should and should not be. this, ultimately, led to an attempt to find the individual, the human, in both those systems. the software allows you to pick certain assumptions, and those assumptions are then fed into the simulation, which uses them as a foundation for how individuals will live and, somehow, prosper. your assumptions shape a society into being, calculating their unbiased impact on digital lives. social contact is divided in three chapters. the first one focuses on how people come together. the second one is dedicated to how people evolve with each other, how culture, love, friendship and oppression appear. the final chapter explores how we, as communities, interact with other communities. a remaining aspect of social contact is the de-mystification of systems. whether political or digital, they are still man-made, and nothing should prevent anyone from wanting to see how a system really works, what it is based on, whether technical processes or political assumptions. the source code of social contact, just like the legislation of modern democracies, is open and transparent.